I'm always so excited to see what vintage treasures, garage sale goodies and inherited finds people link up at our Vintage Bliss Tuesdays parties. Last week was no different - there were so many cool items. I'm sharing a peek at just a few of those finds, united in that they speak to me of spring, warmth and sunshine (seeing as we don't actually have much warmth around here yet!). I loved seeing all of Sharon's vintage jewels over at Blue Willow House. 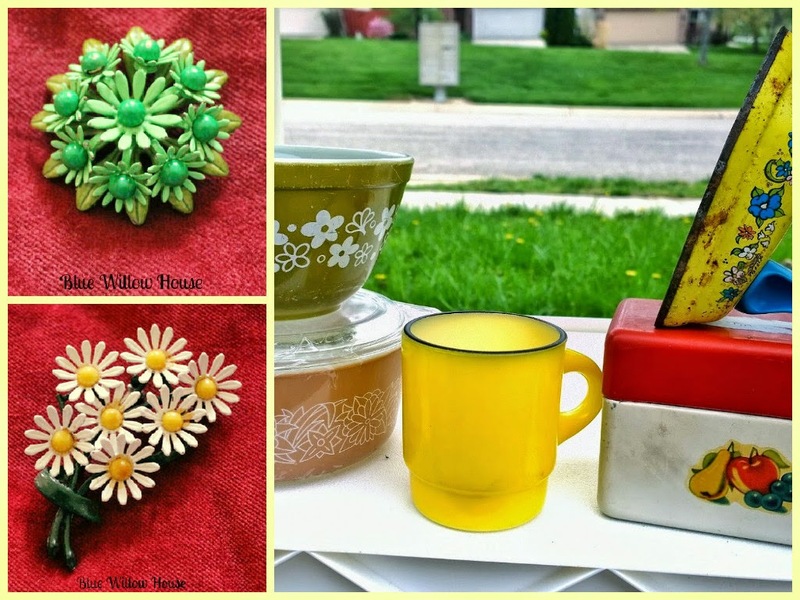 How sweet are these two vintage daisy brooches? Be sure to check out the other items in her collection too. I also enjoyed the picture of Melissa's fun and floral spring finds, including a spring blossom Pyrex bowl she scooped up for 50 cents! We were away at a basketball tournament in Kingston, Ontario for the weekend so I didn't do even a bit of shopping. Well, actually we did browse a little vintage market in downtown Kingston on Sunday. That was just before our two (yes, not one, but two) Nikon cameras (they were sharing a bag) were lost or stolen (or lost and then stolen?). In any case we didn't notice they were missing until we were halfway back to Toronto. I take my cameras everywhere with me, so although this isn't a major problem in the grand scheme of things, I confess I'm a bit lost without them. And I still keep hoping some nice person is trying to get them back to me. And, yes Mom, I said my "Dear St. Anthony, please come around..."
Have you ever lost a treasured item? Did it make its way back to you? oh no!!! I really hope you get your cameras back. I can understand the feeling lost without them! Fingers crossed they're with a kind soul who is trying to find the owner. Thanks Joann for Vintage Bliss Tuesdays 32. I love seeing what others have found and shared. Have a great week. Big ouch about your cameras. OH NO!! I hope your cameras find themselves safely back with you! Oh, and your collage at the top is wonderfully spring-y. It definitely catches your eye! Joann, I hope the camera come back to you. That is so awful. Many thanks for hosting again...love your Spring finds, the brooches are adorable! oh dear sorry about your cameras, ugh! I do hope they make their way back to you, were they marked?